BY LAND. BY SEA. BY EXPERTS. WE ARE ALASKA. With unmatched experience and insider knowledge, Holland America Line are the Alaska experts. Their deep history and roots in the Great Land mean you will discover the iconic and authentic Alaska of your dreams. 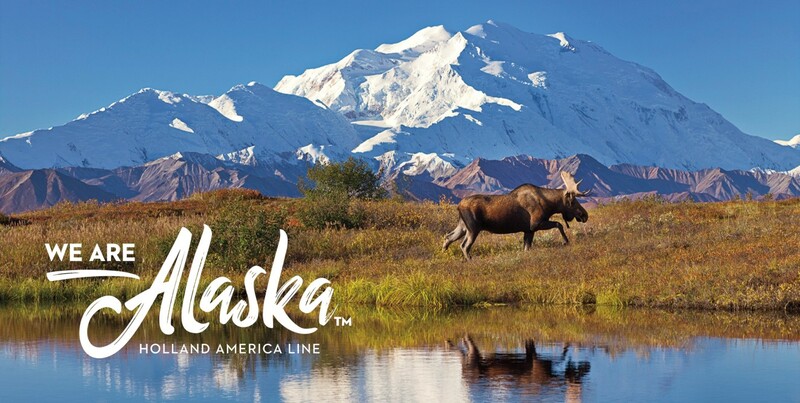 Holland America Line gives you two incredible ways to experience Alaska’s incredible interior. Choose Denali Land+Sea Journeys and stay up to three nights at Denali National Park and Preserve or choose our Yukon + Denali Land+Sea Journeys to enjoy exclusive access to the Yukon Territory. Our Yukon + Denali Land+Sea Journeys consistently receive the highest guest satisfaction ratings of all our itinerary offerings. A Holland America Line Exclusive: we are the only cruise company going beyond Alaska to showcase the Yukon Territory, rich in Klondike Gold Rush history. Also, we have our own McKinley Chalet Resort conveniently located near the gates of Denali National Park with premier lodging, including new junior suites plus other new and upgraded rooms. There’s nowhere else on Earth quite like Alaska and no better way to see it than on board one of Holland America Line’s perfectly sized ships. Contact your travel advisor today!